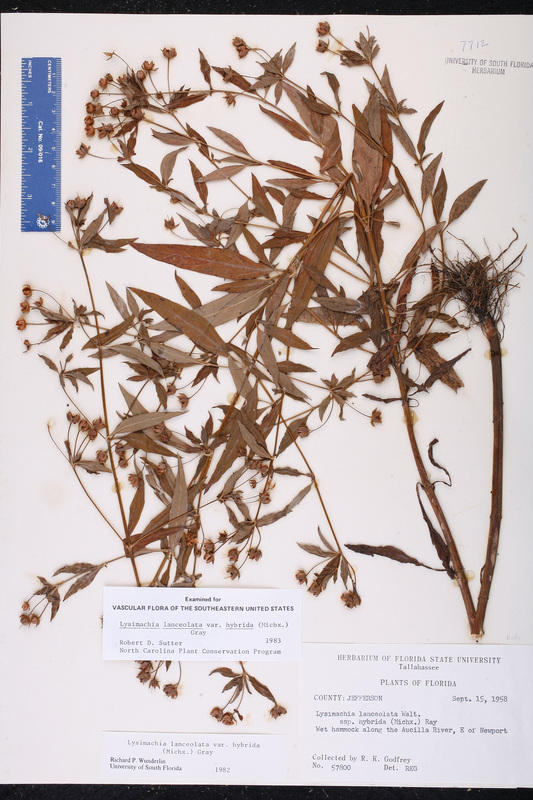 Plant Notes: Cholewa (in FNA, vol. 8) indicated that this taxon (as L. hybrida) shows some degree of morphological overlap with L. lanceolata. Coffey & Jones (1980) also treated this taxon as a species. Citation LYSIMACHIA LANCEOLATA Walter, var. HYBRIDA (Michaux) A. Gray, Manual 283. 1848. Basionym: Lysimachia hybrida Michaux 1803. Lysimachia ciliata var. hybrida Lysimachia ciliata Linnaeus, var. hybrida (Michaux) Chapman, Fl. South. U.S. 280. 1860. BASIONYM: Lysimachia hybrida Michaux 1803. Lysimachia hybrida Lysimachia hybrida Michaux, Fl. Bor.-Amer. 1: 126. 1803. TYPE: SOUTH CAROLINA: Without data, Michaux s.n. (holotype: P). Lysimachia lanceolata subsp. hybrida Lysimachia lanceolata Walter, subsp. 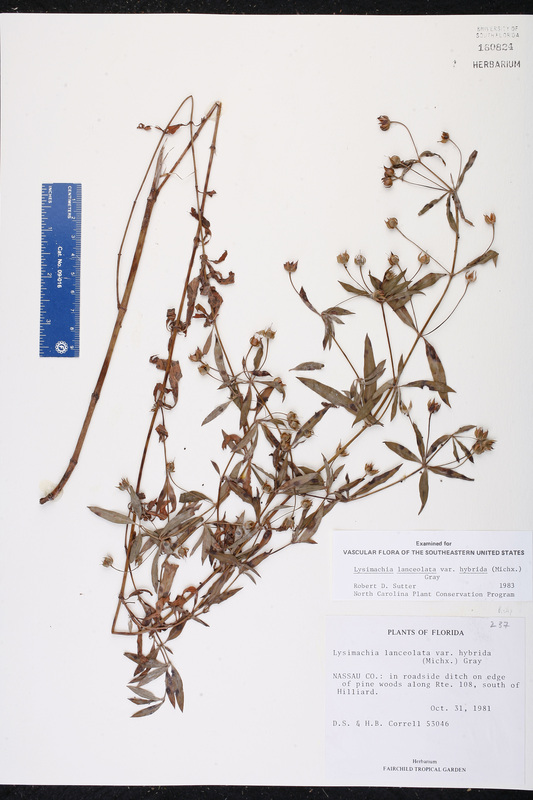 hybrida (Michaux) J. D. Ray, Illinois Biol. Monogr. 24(3-4): 39. 1956. BASIONYM: Lysimachia hybrida Michaux 1803. Nummularia hybrida Nummularia hybrida (Michaux) Farwell, Amer. Midl. Naturalist 11: 67. 1928. BASIONYM: Lysimachia hybrida Michaux 1803. Steironema ciliatum var. hybridum Steironema ciliatum (Linnaeus) Baudo, var. 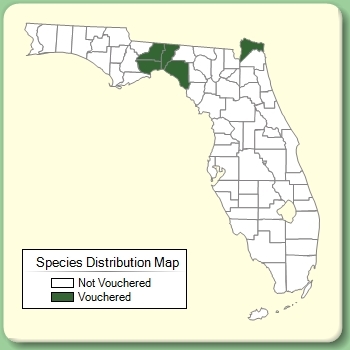 hybridum (Michaux) Chapman, Fl. South. U.S., ed. 3. 298. 1897. BASIONYM: Lysimachia hybrida Michaux 1803. Steironema hybridum Steironema hybridum (Michaux) Rafinesque ex Small, Fl. S.E. U.S. 904. 1903. BASIONYM: Lysimachia hybrida Michaux 1803. Steironema lanceolatum var. hybridum Steironema lanceolatum (Walter) A. Gray, var. hybridum (Michaux) A. Gray, Proc. Amer. Acad. Arts 12: 63. 1876. BASIONYM: Lysimachia hybrida Michaux 1803. Lysimachia ciliata var. validula Lysimachia ciliata Linnaeus, var. validula (Greene ex Wooton & Standley) Kearney & Peebles, J. Wash. Acad. Sci. 29: 487. 1939. BASIONYM: Steironema validulum Greene ex Wooton & Standley 1913. Lysimachia lunellii Lysimachia lunellii (Greene) Handel-Mazzetti, Notes Roy. Bot. Gard. Edinburgh 16: 80. 1928. 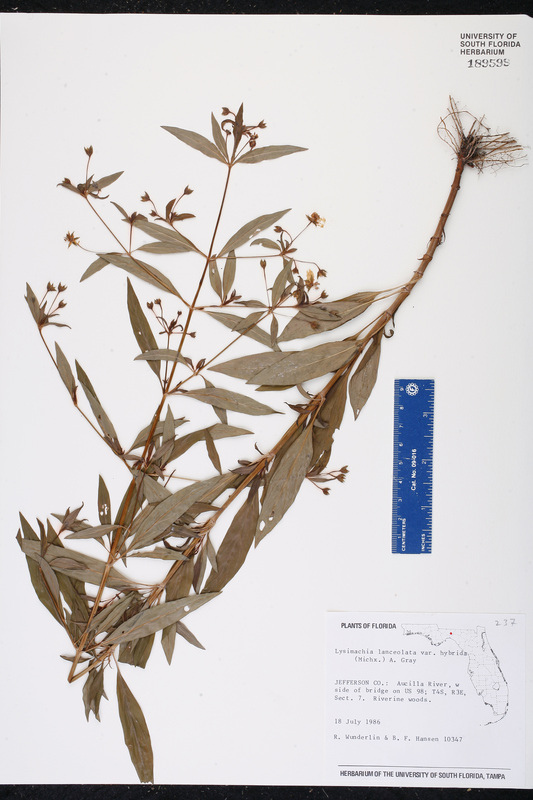 BASIONYM: Steironema lunellii Greene 1910. Lysimachia validula Lysimachia validula (Greene ex Wooton & Standley) Handel-Mazzetti, Notes Roy. Bot. Gard. Edinburgh 16: 80. 1928. BASIONYM: Steironema validulum Greene ex Wooton & Standley 1913. Steironema lunellii Steironema lunellii Greene, Leafl. Bot. Observ. Crit. 2: 110. 1910. TYPE: NORTH DAKOTA: Benson Co.: Near Leeds, s.d., Lunell 804 (lectotype: MIN). Lectotypified by Coffey & S. B. Jones, Brittonia 32: 315. 1980. Steironema validulum Steironema validulum Greene ex Wooton & Standley, Contr. U.S. Natl. Herb. 16: 159. 1913. TYPE: ARIZONA: Coconino Co.: Oak Creek near Flagstaff, s.d., Lemmon s.n. (lectotype: US). Lectotypified by Coffey & S. B. Jones, Brittonia 32: 315. 1980. Steironema verticillatum Steironema verticillatum Greene, Leafl. Bot. Observ. Crit. 2: 110. 1910. TYPE: NORTH DAKOTA: Benson Co.: Near Leeds, s.d., Lunell 802 (lectotype: MIN). Lectotypified by Coffey & S. B. Jones, Brittonia 32: 315. 1980. Steironema verticillatum var. monstrosum Steironema verticillatum Greene, var. monstrosum Lunell, Amer. Midl. Naturalist 4: 505. 1916. TYPE: NORTH DAKOTA: Benson Co.: Without data, Lunell 803 (holotype: MIN).